Back in November last year, I wrote about running Fedora 17 ARM on a Samsung Google Chromebook, via an external SD card. With Fedora 18 now out, I thought it time to try again, this time replacing ChromeOS entirely, installing Fedora 18 ARM to the 16GB internal flash device. Igor Mammedov of the Red Hat KVM team, has previously written a script for automating the install of Fedora 17 onto the internal flash device, including the setup of chained bootloader with nv-uboot. I decided to take his start, update it to Fedora 18 and then extend its capabilities. The Samsung ARM Chromebook bootloader is a fork of u-boot. The bootloader is setup todo “SecureBoot” of Google ChromeOS images only by default. There is no provision for providing your own verification keys to the bootloader, so the only way to run non-ChromeOS images is to switch to “Developer Mode” and sign kernels using the developer keys. The result is that while you can run non-ChromeOS operating systems, they’ll always be a second class citizen – since the developer keys are publically available, in developer mode, it’ll happily boot anyone’s (potentially backdoored) kernels. You’re also stuck with an annoying 30 second sleep in the bootloader splash screen which you can only get around by pressing ‘Ctrl-D’ on every startup. The bootloader is also locked down, so you can’t get access to the normal u-boot console – if you want to change the kernel args you need to re-generate the kernel image, which is not so much fun when troubleshooting boot problems with new kernels. The Chromebook bootloader can’t be (easily) replaced since the flash it is stored in is set read-only. I’ve seen hints in Google+ that you can get around this by opening up the case and working some magic with a soldering iron to set the flash writable again, but I don’t fancy going down that route. It is, however, possible to setup a chained bootloader, so that the built-in uboot will first boot nv-uboot, which is a variant of the bootloader that has the console enabled and boots any kernel without requiring them to be signed. We still have the annoying 30 second sleep at boot time, and we still can’t do secure boot of our Fedora install, but we at least get an interactive boot console for troubleshooting which is important for me. Before continuing it is helpful to understand how ChromeOS partitions the internal flash. It uses GPT rather than MBR, and sets up 12 partitions, though 4 of these (ROOT-C, KERB-C, reserved, reserved) are completely unused and 2 are effectively empty (OEM, RWFW) on my system. Notice from the offsets, that the order of the partitions on flash, does not match the partition numbers. The important thing is that STATE, ROOT-A and ROOT-B are all at the end of the partition table. The /boot partition must sadly be ext2, since the nv-uboot images Google provide don’t have ext4 support enabled, and I don’t fancy building new images myself. It would be possible to have 1 single partition for both the root and home directories, but keeping them separate should make it easier to upgrade by re-flashing the entire ROOT partition, and also avoids the need to build an initrd to handle unlock of the LUKS partition. The actual kernel to be booted is thus ‘/vmlinux.uimg’ in the /boot partition of the Fedora install. There is no Fedora kernel yet that boots on the ARM ChromeBook, so this is a copy of the kernel from the ChromeOS install. Hopefully there will be official Fedora kernels in Fedora 19, or at least a re-mix with them available. The lsm.module_locking=0 argument here is needed to tell the ChromeOS kernel LSM to allow kernel module loading. Running from rc.local in the temporary Fedora root filesystem, the ROOT-A and STATE partitions are now deleted to remove the last traces of ChromeOS. The ROOT and BOOT partitions are then created and formatted. The contents of the temporary Fedora root filesystem are now copied into the new ROOT partition. The system is now rebooted, to get out of the temporary Fedora root filesystem and into the new root. Running from rc.local in the final Fedora root filesystem, the ROOT-B partition is now deleted to remove the temporary Fedora root filesystem. In the free space that is now available, a HOME partition is created. At this point the user is prompted to provide the LUKS encryption passphrase they wish to use for /home. The ALSA UCM profiles for the ChromeBook are now loaded and the ALSA config saved. This will help avoid users accidentally melting their speakers later. An Xorg config file is created to configure the touchpad sensitivity, firstboot is enabled and the root account is locked. Installation is now complete and the system will reboot for the final time. The final system will now boot normally. There will be a prompt for the LUKS passphrase during boot up. Unfortunately the prompt text gets mixed up with systemd boot messages, which I’m not sure how to fix. Just keep an eye out for it. Once the key is entered boot up will complete and firstboot should launch allowing the creation of a user account. Since the root account is locked, this user will be added to the wheel group, giving it sudo privileges. If everything went to plan, the ChromeBook should now have a fully functional Fedora 18 install on its internal flash, with the XFCE desktop environment. Compared to running off an external SD card, the boot up speed is quite alot faster. The time to get to the desktop login screen is not all that much longer than with ChromeOS (obviously I’m ignoring the pause to enter the LUKS passphrase here). You run this script AT YOUR OWN RISK. It completely erases all personal data on your ChromeBook and erases ChromeOS itself. If something goes wrong with the script, you’ll likely end up with an unbootable machine. To fix this you’ll need an SD card / USB stick to follow the ChromeOS recovery procedures. I’ve been through the recovery process perhaps 20 times now and it doesn’t always go 100% smoothly. Sometimes it complains that it has hit an unrecoverable error. Despite the message, ChromeOS still appears to have been recovered & will boot, but there’s something fishy going on. Again you run this script AT YOUR OWN RISK. Optionally edit the script to change the FEDORA_ROOT_IMAGE_URL and UBOOT_URL env variables to point to a local mirror of the files. Watch as it reboots 3 times (keep an eye out for the LUKS key prompts on boots 3 and 4. Then either rejoice when firstboot appears and you subsequently get a graphical login prompt, or weep as you need to run the ChromeOS recovery procedure. The script will save logs from stages 1 / 2 / 3 into /root of the final filesystem. It also copies over a couple of interesting log files from ChromeOS for reference. For a few months now Derek has been working on a tool called PackStack, which aims to facilitate & automate the deployment of OpenStack services. Most of the time I’ve used DevStack for deploying OpenStack, but this is not at all suitable for doing production quality deployments. I’ve also done production deployments from scratch following the great Fedora instructions. The latter work but require the admin to do far too much tedious legwork and know too much about OpenStack in general. This is where PackStack comes in. It starts from the assumption that the admin knows more or less nothing about how the OpenStack tools work. All they need do is decide which services they wish to deploy on each machine. With that answered PackStack goes off and does the work to make it all happen. Under the hood PackStack does its work by connecting to each machine over SSH, and using Puppet to deploy/configure the services on each one. By leveraging puppet, PackStack itself is mostly isolated from the differences between various Linux distros. Thus although PackStack has been developed on RHEL and Fedora, it should be well placed for porting to other distros like Debian & I hope we’ll see that happen in the near future. It will be better for the OpenStack community to have a standard tool that is portable across all target distros, than the current situation where pretty much ever distributor of OpenStack has reinvented the wheel building their own private tooling for deployment. This is why PackStack is being developed as an upstream project, hosted on StackForge rather than as a Red Hat only private project. Anyway back to the point of this blog post. Having followed PackStack progress for a while I decided it was time to actually try it out for real. While I have a great many development machines, I don’t have enough free to turn into an OpenStack cluster, so straight away I decided to do my test deployment inside a set of Fedora 18 virtual machines, running on a Fedora 18 KVM host. The current PackStack network support requires that you have 2 network interfaces. For an all-in-one box deployment you only actually need one physical NIC for the public interface – you can use ‘lo’ for the private interface on which VMs communicate with each other. I’m doing a multi-node deployment though, so my first step was to decide how to provide networking to my VMs. A standard libvirt install will provide a default NAT based network, using the virbr0 bridge device. This will serve just fine as the public interface over which we can communicate with the OpenStack services & their REST / Web APIs. For VM traffic, I decided to create a second libvirt network on the host machine. Next up, I installed a single Fedora 18 guest machine, giving it two network interfaces, the first attached to the ‘default’ libvirt network, and the second attached to the ‘openstackvms’ virtual network. In the installer, I used the defaults for everything with two exceptions. I select the “Minimal install” instead of “GNOME Desktop”, and I reduced the size of the swap partition from 2 GB, to 200 MB – it the VM ever needed more than a few 100 MB of swap, then it is pretty much game over for responsiveness of that VM. A minimal install is very quick, taking only 5 minutes or so to completely install the RPMs – assuming good download speeds from the install mirror chosen. Now I need to turn that one VM into 4 VMs. For this I looked to the virt-clone tool. This is a fairly crude tool which merely does a copy of each disk image, and then updates the libvirt XML for the guest to given it a new UUID and MAC address. It doesn’t attempt to change anything inside the guest, but for a F18 minimal install this is not a significant issue. All of the above is really nothing todo with OpenStack or PackStack – it is just about me getting some virtual machines ready to act as the pretend “physical servers”. The interesting stuff starts now. PackStack doesn’t need to be installed in the machines that will receive the OpenStack install, but rather on any client machine which has SSH access to the target machines. In my case I decided to run packstack from the physical host running the VMs I just provisioned. While PackStack is happy to prompt you with questions, it is far simpler to just use an answer file straight away. It lets you see upfront everything that is required and will make it easy for you repeat the exercise later. The answer file tries to fill in sensible defaults, but there’s not much it can do for IP addresses. So it just fills in the IP address of the host on which it was generated. This is suitable if you’re doing an all-in-one install on the current machine, but not for doing a multi-node install. So the next step is to edit the answer file and customize at least the IP addresses. I have decided that f18x86_64a will be the Horizon frontend and host the user facing APIs from glance/keystone/nova/etc, f18x86_64b will provide QPid, MySQL, Nova schedular and f18x86_64c and f18x86_64d will be compute nodes and swift storage nodes (though I haven’t actually enabled swift in the config). # To set up Horizon communication over https set this to "y"
The current version of PackStack in Fedora mistakenly assumes that ‘net-tools’ is installed by default in Fedora. This used to be the case, but as of Fedora 18 it is not longer installed. Upstream PackStack git has switched from using ifconfig to ip, to avoid this. So for F18 we temporarily need to make sure the ‘net-tools’ RPM is installed in each host. In addition the SELinux policy has not been finished for all openstack components, so we need to set it to permissive mode. That really is it – you didn’t need to touch any config files for OpenStack, QPid, MySQL or any other service involved. PackStack just worked its magic and there is now a 4 node OpenStack cluster up and running. One of the nice things about PackStack using Puppet for all its work, is that if something goes wrong 1/2 way through, you don’t need to throw it all away – just fix the issue and re-run packstack and it’ll do whatever work was left over from before. All-in-all PackStack exceeded my expectations for such a young tool – it did a great job with minimum of fuss and was nice & reliable at what it did too. The only problem I hit was forgetting to set SELinux permissive first, which was not its fault – this is a bug in Fedora policy we will be addressing – and it recovered from that just fine when I re-ran it after setting permissive mode. Today I purchased one of the lovely new ARM based Samsung Google Chromebooks. While ChromeOS is very slick, I don’t have much interest in running that, I got this machine to serve as a dev machine for doing ARM work on libvirt and related projects. Not co-incidentally, this machine has the ARM Cortex A-15 CPU which is the architecture targeted by the new KVM for ARM work. Obviously the first task at hand is to actually get Fedora onto the machine. Fortunately Christopher Hewitt has been here already and wrote up some notes for Fedora 17 on Google+. The notes look good, but when you look, the first step in installing Fedora is to use an Ubuntu host to build a SD card. So what follows is my slightly tweaked instructions for doing the same starting from a Fedora 17 host. We don’t want to blow away ChromeOS entirely, so this guide is focused on booting using an SD Card. I have a bunch of 8 GB SD cards for my SLR, so one of those is re-purposed for this task. The first part of the process is to create the partitions and root filesystem. All the instructions below are to be run as root on the Fedora 17 host. Warning: The existing disk label on /dev/mmcblk0 will be destroyed and all data on this disk will be lost. Do you want to continue? When unpacked, the filesystem will consume about 2.4 GB of space, so a 8GB SD card isn’t strictly needed – a 4GB one would suffice. Before moving onto the next stage, the ChomeBook must be in Developer Mode. Booting into Recovery Mode is the first thing todo. This requires holding down the Esc and Refresh keys, while pressing the Power key. It should now display a nice scary message that the installation is broken. This is of course a lie, so ignore it. Pressing Ctrl-D now will start the switch into Developer Mode. It should now display a less scary message asking if you want to turn off verification. We do indeed want todo this, so press Enter. The ChromeBook will reboot and tell you that verification is disabled. Wait a short while, or press Ctrl-D, and it’ll display another message that it is transitioning to Developer Mode. Erasing local data can take a while, so be patient here. Strangely, there’s a crude ascii art progress bar along the top of the screen here, while everything else remains pretty & graphical. Fedora 17 doesn’t come with a suitable kernel for the Cortex A-15 CPU, so this step grabs the one already present in ChromeOS. Assuming the ChromeBook is now booted in Developer Mode, insert the SD card. From here, run ‘shell’ which gives you a bash session. This says try to boot from the first partition 10 times, then fallback to trying the second partition 5 times. This fallback behaviour is handy if you want to test out custom kernel builds, and have an escape route for when it all goes belly up. It might print out a couple of warnings, but those can be ignored – it will have done what is required. Note that some instructions miss off the ‘set _verb HiFi’ part of this command line. My experiance is that audio did not work unless that was set. That’s it, you’re now ready to rock-n-roll. Power-cycle the Chromebook, and when the initial boot screen appears press Ctrl-U to boot from the SD card. Writing these instructions was interrupted part way through, when I began to realize that the TrackPad on my Chromebook was faulty. I didn’t work at all on first boot of ChromeOS, but second time around it was working fine, so I thought nothing of it. It just got worse & worse from then on though. Looking at the kernel dmesg logs showed the hardware did not even appear visible 60% of the boot attempts. It is probably just a loose cable inside, but I didn’t fancy opening up the case, so I took it back to PC World for an exchange. Thankfully the 2nd unit worked flawlessly. The first annoying thing to discover is that it is only possible to boot custom distros on the ChromeBook while in Developer Mode. This means that at every power-on, the boot screen pauses 30 seconds with a scary warning. AFAICT, there is no ability to sign the kernel images, such that you can boot in Release Mode, without the warning. So before distros have even done any work, it appears guaranteed that their user experience will be worse that ChromeOS on this hardware. Thankyou “verified boot”. Booting up Fedora 17 is significantly slower than booting ChromeOS. While some of this might be Fedora’s fault, I’m not prepared to lay any blame here, since I’m comparing booting from the internal drive for ChromeOS, vs booting from an SD-Card for Fedora. It just isn’t a fair comparison unless I can get Fedora onto the internal drive. It also isn’t as pretty, though again that is mostly my fault for not using graphical boot with Fedora. If the procedure above is followed, you will get a pretty functional Fedora 17 XFCE desktop environment. Since I skipped the part others recommend about copying over the binary Xorg driver for the graphics card, X performance isn’t going to win any benchmarks though. Playing youtube video in firefox with HTML5, in a smallest video size consumes 95% CPU time. I expect proper graphics drivers would help that significantly. The hope is that when Fedora 18 is released for ARM, there will be a remix done specifically for the new ChromeBook which will simplify the setup process, use a normal Fedora kernel, and just generally “do the right thing”. I may well try to re-do this image using a F18 alpha filesystem as the source instead. Two weeks back, I was in Barcelona for LinuxCon Europe / KVM Forum 2012. While there Jeff Cody acquired a photo of many of the KVM community developers. Although already visible on Google+, along with tags to identify all the faces, I wanted to put up an outline view of the photo too, mostly so that I could then write this blog post describing how to create the head outline :-) The steps on this page were all performed using Fedora 17 and GIMP 2.8.2, but this should work with pretty much every version of GIMP out there since there’s nothing fancy going on. 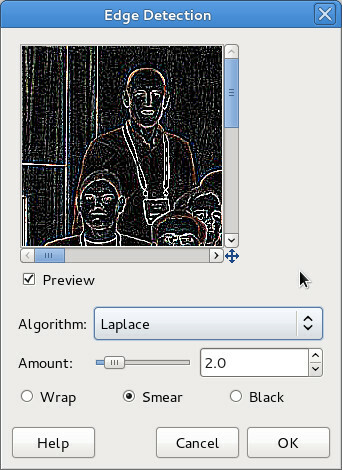 It was thought that one of the edge detection algorithms available in GIMP would be a good basis for providing a head outline. After a little trial & error, I picked ‘Filters -> Edge-detect -> Edge..’, then chose the ‘Laplace’ algorithm. 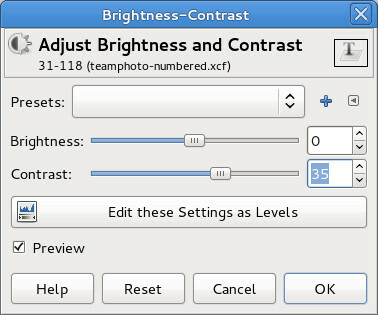 The edge detection algorithm leaves some colour artifacts in the images, which are trivially dealt with by desaturating the image using ‘Colours -> Desaturate…’ and any one of the desaturation algorithms GIMP offers. The outline view is where we want to be, but the whole point of the exercise is to make it easy to put names to faces. Thus the final step is to simply number each head. GIMP’s text tool is the perfect way to do this, just click on each face in turn and type in a number. No need to worry about perfect placement, since each piece of text becomes a new layer. Once done, the layer positions can be moved around to fit well.